This morning I wrote a response to Jake Knapps article on going fast to stay authentic. He was so right! I’d been writing all wrong. The message is to not overthink your writing. The majority of the time, the thing you write first time—in the moment—is good enough. Spend too long deliberating and you run the risk of watering it down. After sharing this to Twitter, I realised you run another risk—you never publish at all. Too many drafts. How familiar is this view? You might have heard of Zero Draft; your first unstructured attempt to write down your thoughts as they flow from your mind. A lot of mine—and maybe your—drafts never become more than that. 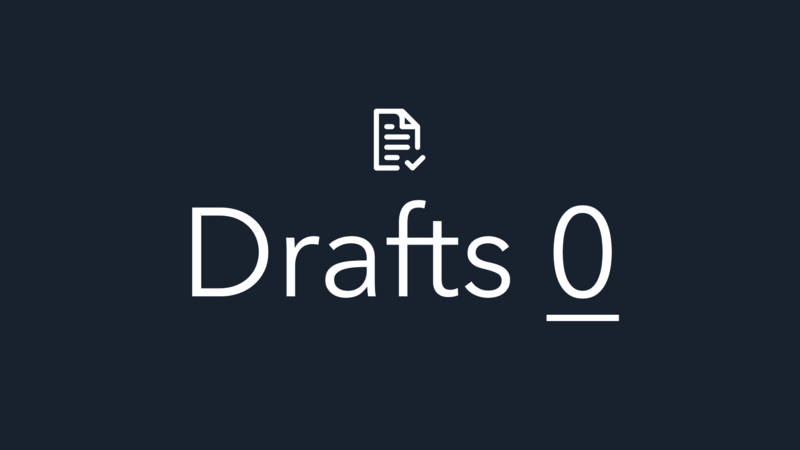 Today, I propose a challenge to achieve Drafts Zero. Every day—excluding weekends—I am going to spend 15 minutes (no more) on finishing and publishing a draft, starting with the oldest. It doesn’t need to be perfect, it needs to be done! Get it out in the open and forget about it. Maybe no-one will read it (no-one will read it in your drafts), or maybe it will spark an interesting conversation. Maybe it will even inspire someone else to do the same. I write for me, and with that mindset I might be happy never publishing, but I’m not. I want to validate my assumptions and ideas. I want to be challenged on them. Plus, every now and then, someone Likes what I write—we all want appreciation, don’t we? I’m weirdly excited by this experiment. I hope you get involved and join me. Let’s get social and spread the word with the hashtag #DraftsZero every time you publish. I will write about how the challenge went at the end. See you in the open. This idea probably only works with short-to-medium-form content. I wouldn’t recommend you write a book this way, though maybe that would make an interesting experiment too.